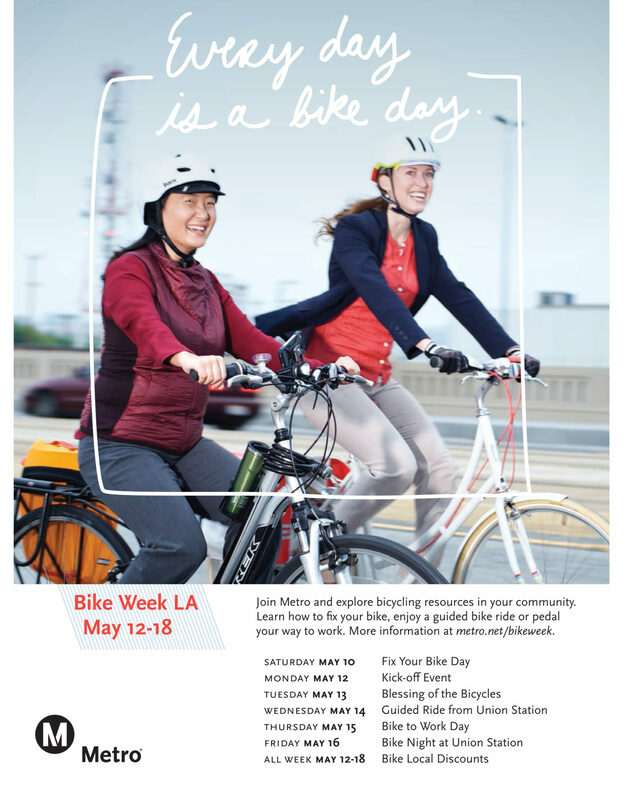 Metro unveils their new Bike Week flyers. So what do you think? A Torrance father is going the extra mile for his daughter. 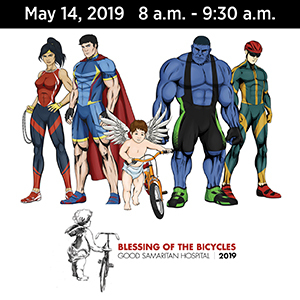 On May 3rd, Joel Elliot will ride his bike 24-hours straight, with a goal of riding 300 miles in that time, to call attention to the rare disease that renders his daughter unable to speak. The purpose of my ride is to bring attention to Hannah, to Selective Mutism, and to the failure of Torrance Unified to properly address Hannah’s needs. My ride will take place on the 1-mile industrial loop just outside of the Strand Brewing Co tap room. I invite you all to come do the first few laps with me to kick off my 24 hours. After a few laps, I will continue solo and the group will move into the tap room to celebrate and prepare to help support my long ride. We will do something similar on Sunday when I finish. I would love to have a large group of riders as there is a good chance local news will be there. A couple of important court hearings today. 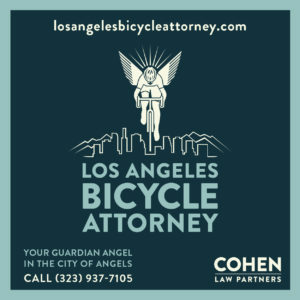 First up, cyclists will ride to attend the sentencing of Wendy Villegas for the drunken hit-and-run death of Andy Garcia. And riders are encouraged to attend the pre-trial hearing for Jose Gonzales, charged with vehicular manslaughter in the death of Pasadena cyclist Phillip O’Neill. Sometimes it seems like justice moves slowly. 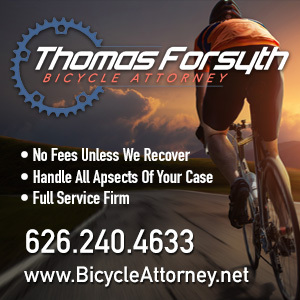 And it doesn’t often seem sufficient in cases involving bike riders. But at least prosecutors seem to be paying attention these days, in part because cyclists are turning out for cases like this. I plan to spend a lot of time checking out this website about Vintage Trek bikes. My 33-year old steel-frame Trek is still parked in my office, waiting for the funds to fix it up and get it back out on the streets where it belongs. It may not be as fast as my LeMond, but it hugs the road like it’s on rails, and you won’t find a smoother ride anywhere. My wife has suggested selling it more than once. But after roughly 130,000 miles stretching from LA to LA — Louisiana to Los Angeles — I’d no more get rid of it than I would her. West LA Councilmember Mike Bonin helps a city work crew prepare for Backbone bike lanes on Manchester Ave. Flying Pigeon says South Pasadena’s Public Works Commissioners should be sued for refusing to close a dangerous 528 foot gap connecting with LA’s new bike lanes on York Blvd. The Hollywood Reporter reviews the new women’s cycling documentary Half the World, and finds it not to their taste. The Eastside’s Ovarian Psychos Brigade will screen the Saudi Arabian bike-themed movie Wadjda as a fundraiser this Wednesday. 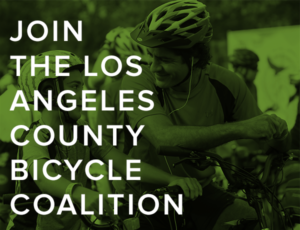 CICLE is looking for volunteers for next month’s Bike Week Pasadena. The local mountain bike racing season starts at the end of next month. Mad props to the 75 fifth graders — yes, I said 5th graders — who rode their bikes 267 miles from Yuma AZ to Carlsbad CA over spring break, riding up to 53 miles a day and up a five-mile climb. At that age, I was happy to ride to the other side of my own neighborhood without falling over much. A new San Diego River bike path allows cyclists to ride from Ocean Beach to the 805 Freeway. Frequent contributor and ghost bike documentarian Danny Gamboa will be curating the Bike Love Art Show next month in Ventura. Knowing Danny, I’d highly recommend checking it out. Cyclelicious looks at the need to develop a traffic safety culture. UC Berkeley student with Crohn’s Disease will ride to LA to raise funds for a cure. A San Francisco cyclist is understandably critical of the way the city’s police deal with cyclists after they let the driver who rear-ended her and her son drive away without even a ticket. Tiny Arcata CA — population 17,726 — could soon have one more bike boulevard than massive Los Angeles, which currently has none for its over 3.8 million residents. Correction: Richard Risemberg writes to remind me that LA does actually have a bike boulevard, aka bicycle friendly street on Yucca Street in Hollywood, though it doesn’t actually connect to anything. The national traffic fatality toll is bad enough; now it turns out it doesn’t include motor vehicle deaths that don’t occur in traffic situations. So add another 6,483 deaths and 91,000 injuries from 2008 to 2011, 39% of whom weren’t in cars. The publishers of Momentum Magazine says it’s time to move the conversation beyond helmets. I couldn’t agree more; there are lots of good reasons to wear one, but no adult should ever be compelled to. Bicycling’s Heidi Swift says riding through a cemetery isn’t disrespectful, it’s showing respect for life. Someone should explain that to the director of the Los Angeles National Cemetery, which continues to ban bikes for reasons I will never understand. A Texas woman gets a well-deserved 10 years for killing a bike rider while drinking, using her cellphone and falling asleep at the wheel. Cincinnati proposes killing trees to preserve parking while making way for a protected bike lane. A writer for the Times rides along with Boston’s equivalent of LA’s Marathon Crash Race. Great Britain is opening a memorial to bicyclists killed in war; turns out the first British soldier killed in WWI was a 15-year old bike rider who lied about his age — and may have been killed by friendly fire. The reward for recovering a stolen Brit bike is home-made banana bread. Once again, a cyclist is caught on video narrowly avoiding getting hit by a train, this time in India; the rider had to abandon his bike on the tracks to get away. If you’re going to steal a bike, don’t park it at the local Walmart, then go inside and fall asleep on a bean bag chair. And Gothamist totally freaks out over a helmetless Orthodox father riding a Citi Bike with his helmetless daughter on his hip.